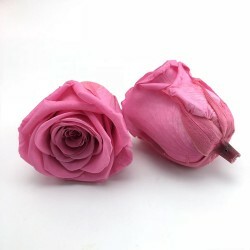 We are the US Distributor of Preserved Flowers. Each Preserved Flower has been grown, harvested and preserved with Natural Ingredients and Dye. So they remain soft to touch and will not wilt or die. All preserved items are interior grade only and must be kept at the same temperature with no sudden changes to the heat or humidity as this can cause the glycerine to leach with can cause staining to surfaces. Preserved Products are for Interior Use Only.